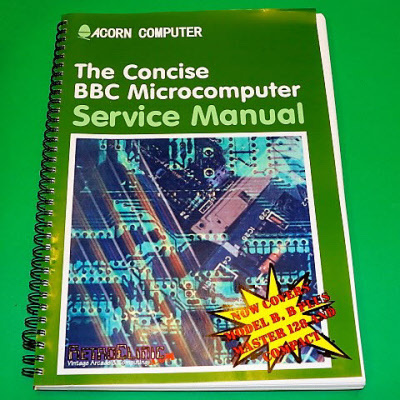 This is a new modernised and expanded copy of the BBC Micro Service Manual. It covers all of the BBC Micro range, using a compilation of the best parts of all the original service manuals and technical notes from Acorn. It has been completely reworked and laid out to be easier to read, as well as every page now being in full colour. It's essential for BBC repairs and gives a comprehensive insight into how things actually work under the hood of the Beeb. Schematics for all the above machines, including the main PCBs, Keyboard, Power Supply, Econet Module etc. This new manual also goes on to describe refurbishment and repair of the power supplies with full colour photos, something not included in the original service manuals. Laid out in A4 double sided, with all 224 pages of the main manual printed in full colour on a professional wax offset printer, the manual is faithful to the original Service Manuals available to Acorn dealers and service agents, but is also modernised and updated where necessary. The last 5 pages of the manual consist of five A3 size schematic diagrams, that fold out for ease of use. The schematics are of all 4 machines covered in the manual, with the one for the Master 128 split over 2 pages.